The room numbers are those referred to on the pompeiiinpictures pages for VIII.2.39. The plan also shows the location of VIII.2.38. In order to allow cross referencing in your research we have used the same room numbering as that used by Dr P M Allison in her book Pompeian Households: An Analysis of the Material Culture (Cotsen Institute of Archaeology, Monograph 42) and on the accompanying web site http://www.stoa.org/projects/ph/house?id=29 where detailed descriptions of the rooms and a database of finds can be found. According to Mau there were additional rooms on the mezzanine level that now no longer exist. 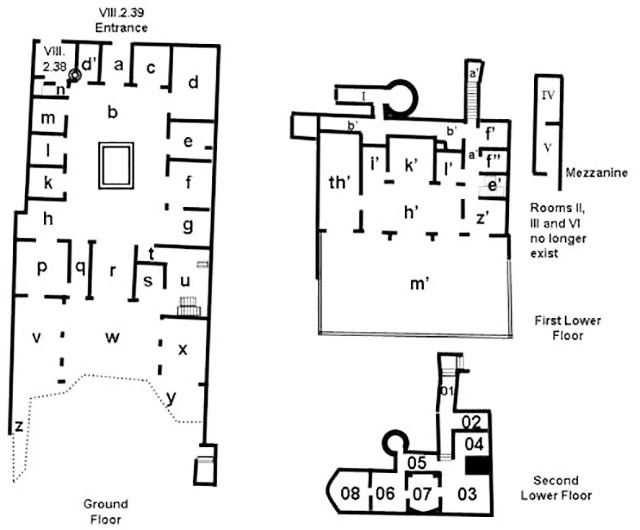 Room II was above room i', Room III was above room l' and room VI was to the south of room V.